Learning to shoot, to be a good marksman is no different than any other skilled that you have acquired in your life: it takes a lot of practice, a lot of patience, and then even some more practice, but in the end you will be able to stab your toe with the best of them. However, unlike most other sports, when it comes to shooting, the learning process can be extremely expensive. Unless, that is, you start reloading your own cartridges or shells. The process itself is very simple, straight forward, and many gunners consider it extremely therapeutic. It will certainly give that intimate knowledge about the inner workings of a gun that will improve your status as a marksman. However, when handloading, you will need a high quality press or else risk having the bullet explode in your face. That is why we took extra care when evaluating the following top 10 best reloading presses. You can find the most significant details about them, like price and Amazon rating in the list below, but we recommend scrolling past the list and paying attention to the in depth reviews for each press before committing to one. But before we proceed, a word on safety: make sure to always keep your weapon, ammunition and even gun powdered in a safe. If you do not currently own one, make sure to check out our Top 10 Best Gun Safes list. If you are a novice in the reloading or handloading game, and you only need to reload shells or cartridges for your own use, then the best choice you could make is the RCBS Rock Chucker Supreme Master Reloading Kit. There is no point in spending more money on one of the more elaborate presses we are going to feature here, and, since you are just now learning the trade, it would be safer for you to start with this press rather than the cheaper presses we are also going to feature for advanced users. 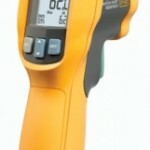 It was awarded a 4.8 star rating on Amazon by 66 customers, and it well deserves that praise. It comes with everything you could need from a reloading press including the loading block, deburing tool, a uniflow powder measure, priming tool and a kit for lubing the cases. You will have to go through each operation step by step, but for a single shooter’s needs that should not be too much. There are 2 basic types of reloading presses, there are single stage reloading presses, like the RCBS we have already featured is, and an auto-indexing, progressive reloading press, like Hornady Lock N Load Auto-Progressive Reloading Press we are going to talk about here. 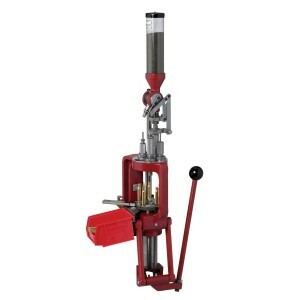 The advantage of an auto-progressive reloading press is that you can setup the shells, the primers, and the gun powder and then the machine handles all operations at the same time while you continue feeding it new shells and topping the filled shells with bullets. The process is fairly complex unless you have some experience, which is why we do not recommend this machine to beginners. Advanced users, however, will love the fact that you can change from a 223 to a 45 in less than 5 minutes due to the 5-station bushing system. 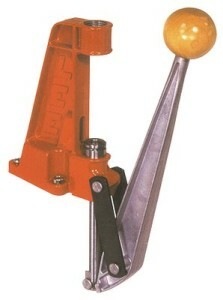 The metering inserts can be changed quickly, without the use of tools, and the retainer spring for cases is universal. You will also love the fact that you have a large capacity hopper, so you can go through the entire process fairly quickly. We have already warned you that we will feature a list of relatively inexpensive reloading presses that, although excellent within themselves should be approach with care. The RCBS Rock Chucker Supreme Press can handle any type of caliber, even the mighty 17 and can be upgraded to work as a progressive loader if you buy the additional Piggyback system. It has even earned a 4.8 star rating on Amazon, but that is just from 14 users, simply because it is not a traditional reloading press and it will take some getting used to. 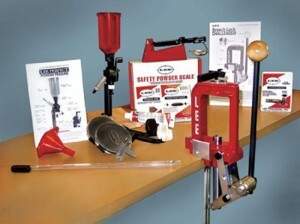 We are going to feature several Lee Precision presses on our top 10 best reloading presses of list and that is because they are the top name in this field. They have managed to earn this name because they focus on delivering unpatrolled precision in their reloading systems. However, that has also created a bit of a problem because their best models are focused on just on type of weapon or bullet. The Lee Precision Load Master 45 Reloading Pistol Kit is perfect if you are only going to be handloading pistol bullets, and it will deliver an incredible level of precision, but it is of no use for any other type of cartridge. When it comes to single stage reloading presses the Lee Precision 50th Anniversary Reloading Kit is an unparalleled work of art. However, it is not as simple to use as the RCBS Rock Chucker Supreme Master Reloading Kit and you will be hard pressed to understand the manual it comes with. Also it is more of a showpiece than an actual press that you can use, day in and day out, for years. Still it has earned a 4.5 star rating on Amazon from more than 100 customers, so it deserves a place on this list. The Lee Precision Load Master 223 Remington Reloading Rifle Kit is the one single purposed reloading press that we think will be and should be loved by one segment of our readers above all other presses. It is the perfect tool for riffle cartridges, so if you are a huntsman, and only use riffles, make sure to choose this press over any other. 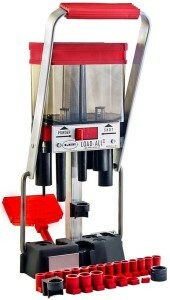 It time you may need a different press if you decide to buy a pistol, but for the type of accuracy you need when hunting, you will need a dedicated reloading press. The first thing that needs to be said about the Lee Cast Aluminum Pro 1000 is that it is an incredibly light tool. 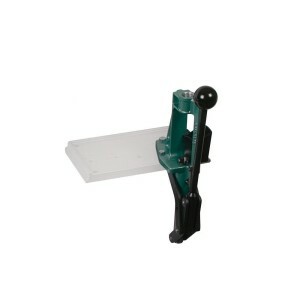 It is made almost entirely from aluminum which makes this one of the few mobile reloading presses on the market. The problem, however, is that, like most Lee products, it was designed for a specific ammunition type. So if you only need to handload 9MM Luger shots, then you are going to love this particular press. If you have most of the kit required for a reloading press, and, for some reason you need just the press, then the RCBS Partner Press is the answer for you. It is an incredibly sturdy press, in fact it is the central piece of the kit we started the list with. Is has earned a 4.3 star rating on Amazon, but it deserves so much more, so do give it a chance if this is all you need. It was very difficult to set any order for the Lee reloading presses, because they all focus on different types of ammunition, so we ended up distributing them by price rather than anything else. 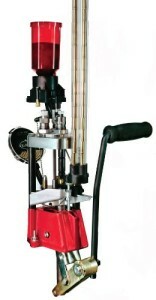 The Lee Precision II Shotshell Reloading Press, for example, is one of the best and cheapest presses on the market today. 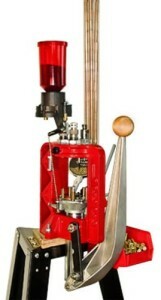 It is actually the perfect press for any type of shotshell ammunition and, again, if you are going to limit yourself to only one weapon, you should definitely by a specifically designed press like this. 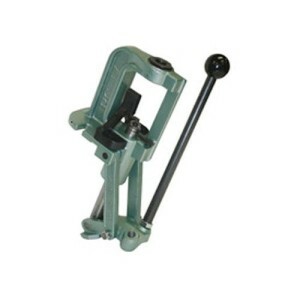 Do not be fooled by the low price on the last item on our list, the Lee Reloading Press. It is so inexpensive because all that you are really buying is the bare bone press. 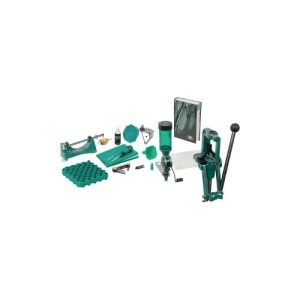 You will need to buy all the additional dies, priming tool, powder measure, case trimmer and so on. The press is very cheap indeed but you will end up paying a lot more for the entire system, than you would have paid if you had just bought the simple kit we started this list with.